On Saturday 27 May 2017 Chief of Navy VADM T. Barrett unveiled Brisbane’s first Naval Statue Memorial i n front of hundreds of ex-sailors and families who helped raise the necessary funds for the completion. The plinth’s side panels hold brass plaques naming all the conficts and where possible the ships that served in those conflicts that the RAN has served in since Federation. In the front is a blue polished granite stone with the RAN badge and the Naval Ode embossed in gold. The statue is a 2mtr. high leading seaman in the uniform of the pre 50’s and 60’s. It is the hope of the FESR Navy Association & the NAA QLD section that this memorial with its positioning across from the QLD Maritime Museum will become the hub of all naval ceremonies here in Brisbane in the years to come, this statue completes the plinth of the South Brisbane Memorial Park a project that was made by the diggers after WW1 but was never completed until now. A step , on the road to home. The clay model of the Sailor for the Naval Memorial is now ready for the casting at the foundry, it is hoped that completion and dedication of the Naval memorial will be in the first half of this year. It has long been the concern of many Queenslander’s who have served their country in the Royal Australian Navy and in many cases have paid the supreme sacrifice. That Brisbane and to the greater extent Queensland lacked a true Naval Memorial depicting that service. With this in mind the Queensland Division of the Far East Strategic Reserve Navy Association have joined with the Queensland Naval Association of Australia to try and rectify this situation. 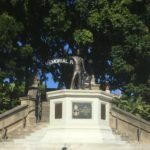 We have sought the service of a renowned Queensland sculptress to create a bronze statue of a sailor in pre-1960 No1 rig uniform with a seabag at his side waving goodbye. The sculptress has completed similar projects, such as The Year of The Outback, which stands outside the Council Chambers at Boonah. After numerous site suggestions we have obtained a site from the Brisbane City Council adjacent to South Bank Memorial Park opposite the Queensland Maritime Museum. The statue will be 2 metres high on a 2mtr octagonal plinth it is visualised that the front will feature a plaque of blue granite with the Naval Logo in gold and the Naval Ode each of the other sides will carry a plaque depicting the ships names in all wars since Federation. WW2 will have all the Battle Honours due to the number of ships involved, is hoped that this memorial when finished will serve as the pinnacle place for all naval events, long overdue in Brisbane. To date, a memorial such as this has not been erected in Queensland and therefore is truly unique and worthy of acknowledgment. It will stand for years to come, marking a moment in time when naval veterans banded together to right an injustice, making a difference not only in their own lives but in the lives of many. The committee has be seeking funding through Federal and State Governments subsidy schemes, and our own membership bases, but it is anticipated that the cost of the statue at $70,000 will exceed grant expectations. That is why we are seeking financial backing from the private sector; navy oriented associations and from present and past serving members it is our intention to have the names of major donors of $1,000 and members names of a $200 donation inscribed on a brass plaque adjacent to the memorial. It is our wish that this memorial will honour not only the past, but also touch the social consciousness of generations to come. To date the statue is almost ready for casting; funds are still required to finish this project. There is still time for you to donate and become a part of this truly unique Naval Memorial, the committee would welcome your support in helping to make this memorial a reality, honouring the service past and present of all who served in the Royal Australian Navy. May you all have A Very Merry Xmas and may the New Year bring you Good Health and Prosperity to you and yours. Soon to be entrenched the 31st of August to be gazetted as the “Malaya & Borneo Veteran’s Day”as a result of talks between Maj.Gen J C Hughes AO DSO MC, and Maj Gen Brian (Hori) Howard AO MC ESM, this long awaited recognition will be confirmed and duly recorded in the Australian Military Calender of Commemorations in the near future.